A lost Johnny Cash album that the Man in Black recorded in the early Eighties, Out Among the Stars, came out this week, and it included the song “She Used to Love Me A Lot” and his take on tracks like Hank Snow’s “I’m Movin’ On” and Ed Bruce’s “After All.” A few days after the record finally hit stores, its compiler, Johnny’s son John Carter Cash, sat down for a Reddit AMA, answering questions on everything from old records to his old man’s eating habits, concluding with this cuddly photo of his dad. Here are five things we learned. 1. Johnny and Rick Rubin used take communion together over the phone. 2. Bob Dylan jumped on Johnny Cash’s bed the first time they met. According to the account the singer gave to his son, Cash met Dylan in a New York City hotel room in the early Sixties. 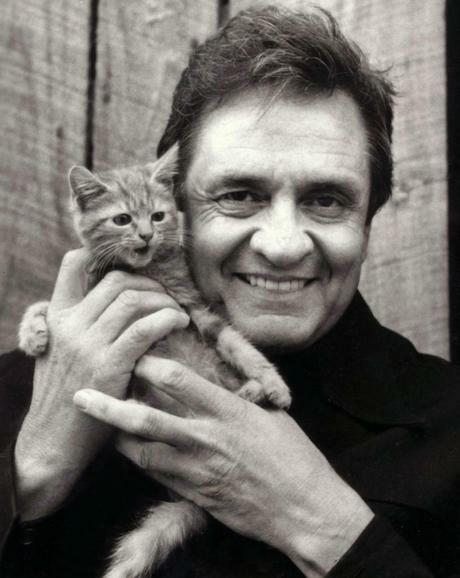 Although they had exchanged letters, upon finally meeting one another, “Dylan rushed into his room, jumped on the bed and began bouncing up and down chanting, ‘I met Johnny Cash, I met Johnny Cash. '” Although they fell out of touch as time went by, they remained friends. 3. Out Among the Stars was shelved – literally. “Physically, literally, this record was put on the back shelf,” the younger Cash wrote. According to his account, in 1984, Columbia “was losing interest in” and “didn’t know how to promote” his father’s new work, and so tapes ended up in a vault in his office, where they remained until two years go. 4. That vault doesn’t exist anymore. All the tapes have been removed, providing the source for the potential “four or five” albums of unreleased material, and the vault is now empty. John’s favorite discovery within it? A “wonderful record of my father singing and playing guitar by himself” that was released on Bootleg Volume 1: Personal File. 5. Johnny Cash loved deep-fried chicken skin. And crunchy peanut butter and fried catfish, but those two are a bit less grotesque.